Easter is a very special time of the year and while the Captain and I attend church on a regular basis….I especially like going to Sunrise Easter Services. …..and now that we live in Florida….where else to have Sunrise Services, but right on the beach. It is really beautiful with the aqua colored ocean waters lapping on the white sands of the beach… as our Pastor retells the Easter Story…of Jesus. After the Sunrise Services, we like to return home and prepare a wonderful Easter Brunch for a few of our friends. This year was no different…and I would like to share with you three recipes for our Menu for Easter Brunch. 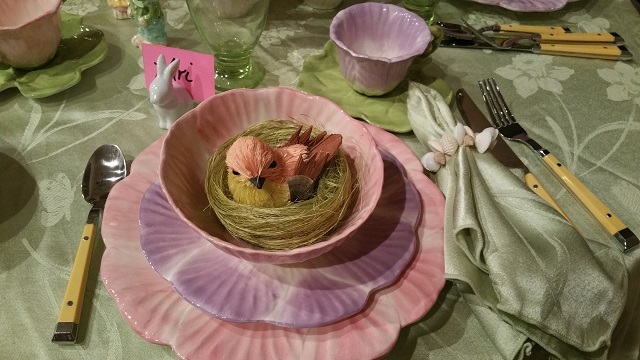 I also love tablescapes reflecting my dinner theme. 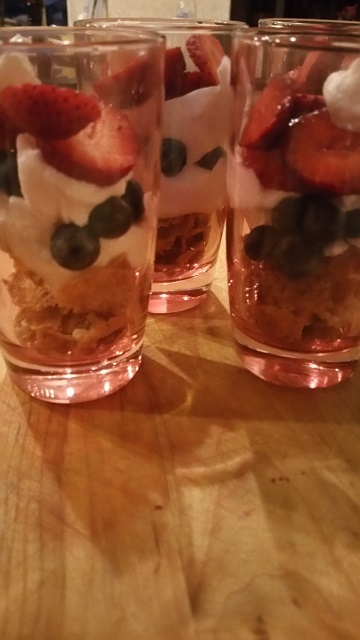 The first prep began with a simple Very Berry Parfait that I put into pretty pink glasses…I used blueberries and strawberries but you could certainly use whatever berries you prefer. 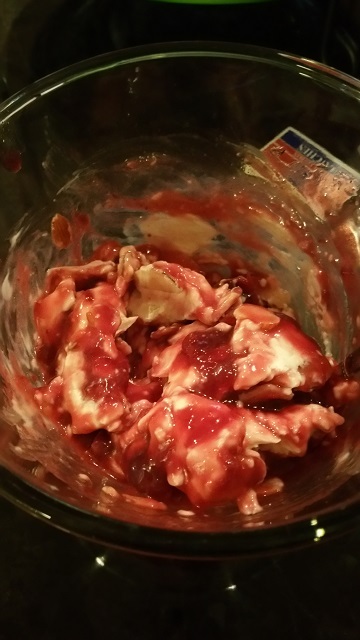 I layered a granola mix in the bottom of the glass and added a plain Greek Yogurt and the berries. Easy Peasy and delish! The second recipe was a Turkey Hash. I browned turkey sausage and turkey bacon and then added bell peppers and onions and potatoes. Another easy dish because you start the ingredients on top of the stove and then pop in the oven to finish the cooking. With the Very Berry Parfaits in the fridge and the Turkey Hash in the oven, it was time to prepare the filling for the French Toast. The filling was made of softened cream cheese and sliced almonds…and here is the best part….Bonn Maman 4 Fruits Preserves. YUMMY! I really like these French Jams and preserves, but you could certainly use a jam of your choice. Peach! Strawberry! Cherry! Endless possibilities. 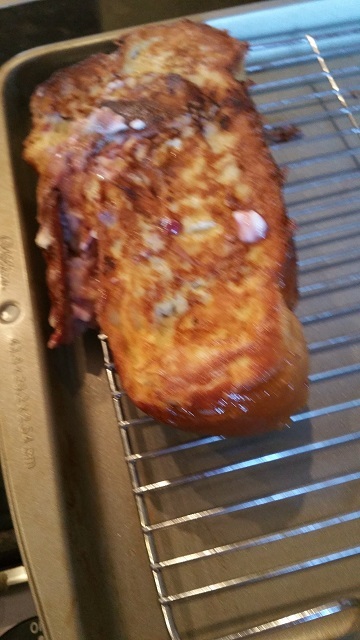 I cut a slit in thick slices of Challah Bread, which is a wonderful Egg Bread….and put the cream cheese filling into the slit. I dipped the bread in beaten eggs with almond milk and browned them in a cast iron skillet. Just look at a bit of the wonderful filling oozing out! So Good! If you don’t have a cast iron skillet, a griddle or grill would work nicely too. I put the browned slices of French Toast on a rack set atop a sheet pan and popped them in a 200 degree oven along with the Turkey Hash. Then all I had to do was pour the orange juice…(Mimosa anyone? ), Set out the Keurig for individual cup-coffee making, Bring in the gallon jar of Sun Tea “brewing” on the Lanai and pick a few sprigs of mint from my Herb Garden and Presto, A very nice easy Brunch was made. Later in the evening, the Captain and I entertained other friends and we prepared a Ham Steak with Pineapple Chutney Dinner which I will share with you another time. I just love to entertain and twice in one day is pretty cool…especially if you keep it simple. 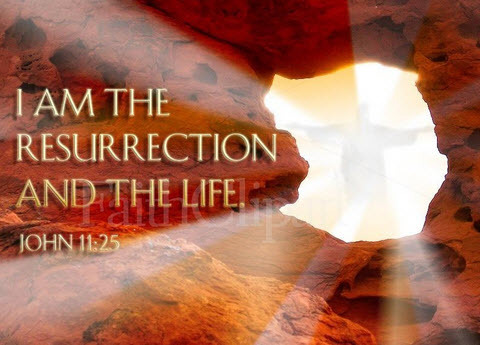 I hope you all had a Blessed Easter! 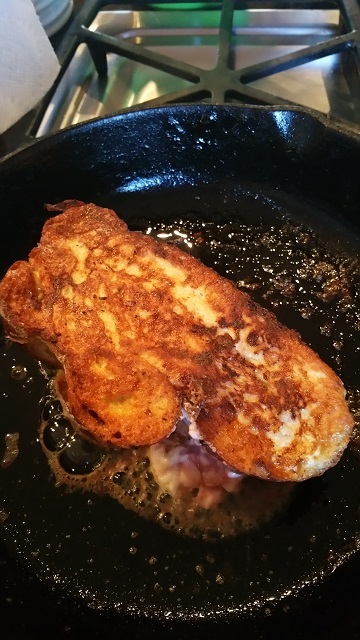 A very quick and easy stuffed French Toast recipe....cream cheese and wonderful Bonne Maman 4 fruit preserves filling, along with Challah Egg Bread make this an extra special French Toast. Combine the eggs, brown sugar and almond milk beating with a whisk to incorporate the ingredients and set aside. Make a slit in the top or bottom of the slice of Challah to form a pocket. Transfer the cooked French Toast to a baking sheet fitted with a baking rack and place in a 200 degree oven until serving. Serve with plenty of warm pure maple syrup. I really like the Bonne Maman 4 Fruit Preserves from France...you can find this at WalMart...altho it is a bit more expensive than many brands of jams and jellies....but the flavor is definitely worth it. I love Hash...whether it be corned beef or otherwise.....this is a healthier version because I modified by using Turkey Bacon and Turkey Sausage. 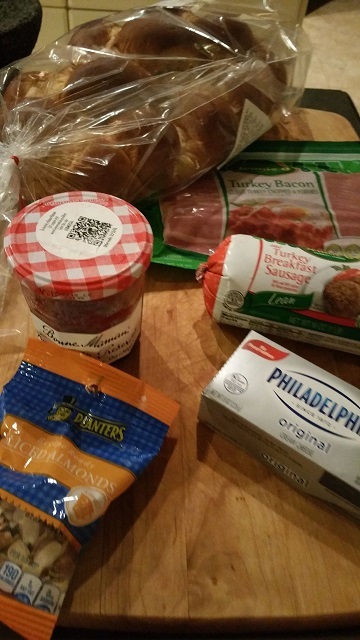 Of course, you could substitute any breakfast meat of your choosing. 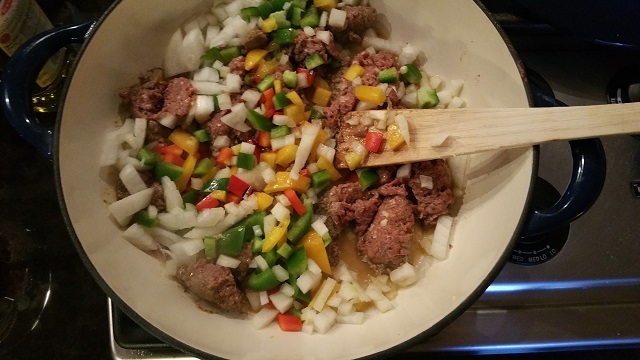 Be sure to break up the turkey sausage as you cook as it tends to clump...you can use a fork or the back of a wooden spoon. 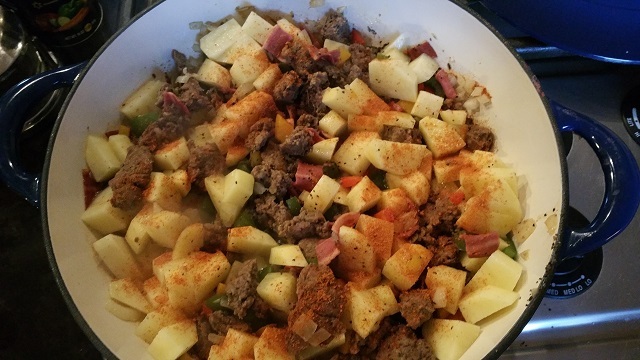 Add the potatoes and sprinkle with taco seasoning,salt and pepper. Place the brazier pot into a preheated 350 degree oven for about 15 minutes. This Hash can hold in the oven for 30 minutes so it is a great "prepare ahead" hash. I like to add a little granola cereal to this parfait. 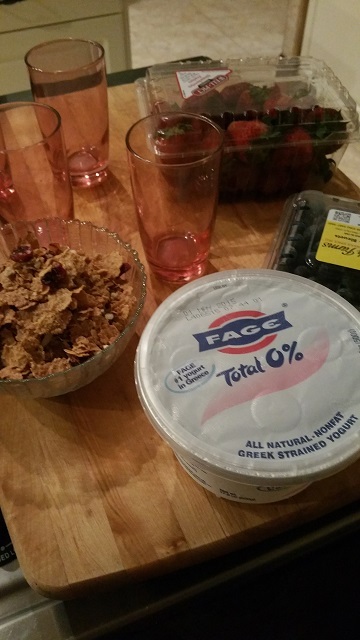 In fact, there is a particular brand that has dried cranberry, almonds, and clusters of multi-grain crunch that is really good..
Add the yogurt, blue berries, another layer of yogurt and top with strawberries and another dollop of yogurt. Or choose your own layering...it is all good no matter the order of ingredients. Sprinkle a little granola on the top and place in the fridge until ready to serve. If you don't want to use a pre-made granola, you could make your own by using a couple cups of rolled oats, 1 cup of pecans, 1/2 cup of sunflower seeds, 1/2 cup of peanuts, And .... 1/2 cup of honey and 1/2 cup of brown sugar. Bake on a baking sheet for about 30 minutes at 350 degrees (be sure to stir frequently). Use the proportions you like ...but you get the idea. Hi Kari, sounds like you had a busy day entertaining, I hope you managed to slot in a lazy bath or a moment of reflection in your secret garden too. Thanks Ross for stopping by….yes, it was a busy day and then on Monday at 5 pm…we hosted our New Residents Group Potluck….So a very busy 2 days. Miss you my friend…and looking forward to seeing you again.